(PANDORA) - The girls basketball team bounced back from their first league loss in a big way with a 58-26 shellacking of Pandora-Gilboa on the Rockets’ home floor. Junior Alivia Koenig poured in a game high 26 points including eight 3’s to lead the offensive charge. Bluffton improved to 11-4 with the win, PG fell to 3-11. Bluffton stretched a 16-9 first quarter lead out to 30-14. Koenig drained five 3’s in the first half alone. Alivia hit three more long balls in the third quarter as the Pirates pushed the lead out to 45-23. Averey Rumer scored five points in the fourth quarter. 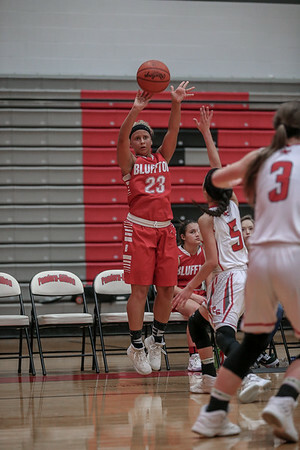 Bluffton out-rebounded Pandora-Gilboa 18-14 and forced 20 Rocket turnovers.